A growing chorus of voices is saying we’re on the cusp of another stock market “lost decade.” I wrote previously about earlier predictions of a lost decade, but now even more data from credible sources warns of a very-extended dry spell for equities. A 10-year period culminating in a zero return for stocks – or even a negative return – could be nothing short of catastrophic for your financial security. It’s imperative that you take action now (before things get bad) to help your portfolio move forward in the event equities struggle for many years. Gold and silver investments could offer some relief. Some of the latest information predicting a lost decade is detailed in a recent MarketWatch article that showcases analysis of the S&P 500’s potential future by financial expert Stephen Jones of New York City. Jones analyzed what the next decade could have in store for the stock market by applying metrics developed and relied on by some of the biggest names in business and economics. His conclusion? The next 10 years do indeed look pretty sour for the equities markets. Jones first looked at the S&P 500 through the lens of the Shiller P/E, a metric created by Nobel-Prize-winning economist Robert Shiller. As applied to the S&P, the index price is divided by the component companies’ earnings as adjusted for inflation over the past 10 years. According to Jones, the Shiller metric predicts an annualized real total return of 2.6% for the S&P 500 over the next 10 years. Then there’s Warren Buffett’s favorite metric: the ratio determined by dividing total market capitalization by gross domestic product, which I discussed in a recent article. Jones says Buffet’s method of evaluating the S&P 500’s coming prospects telegraphs an annualized return of -2.0% for the next decade. Jones also examines the S&P 500 using Tobin’s Q Ratio, named for 1981 Nobel laureate James Tobin. The Q Ratio is calculated by dividing the market value of U.S. equities by the replacement cost of their assets. Applying this metric in his research, Jones says the annualized real total return of an all-equities account could be -0.5%. 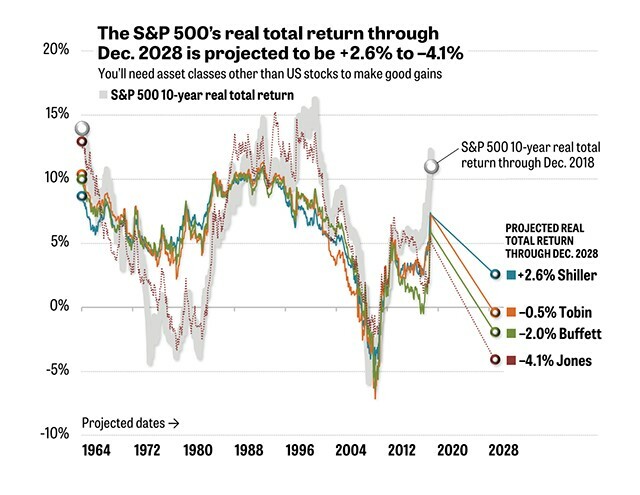 Jones says that metric is telling him the S&P 500 will see an annualized real total return of -4.1% over the next 10 years. That would result in a portfolio worth $100,000 today dropping to a little over $66,000 by the end of the decade. If accuracy of the Jones Composite holds true, stock investors could be looking at especially disappointing years on the horizon. How much “stock” you put in one man’s analysis is up to you, of course – you can read more about Jones’ methods here. But other prominent investing voices have been saying much the same thing for some time, and the market is known to be significantly overvalued and demonstrating tremendous volatility. It makes sense to take steps now to defend against these conditions in a decade that could be disastrous for stocks. Why risk suffering a stock market lost decade when you don’t have to? 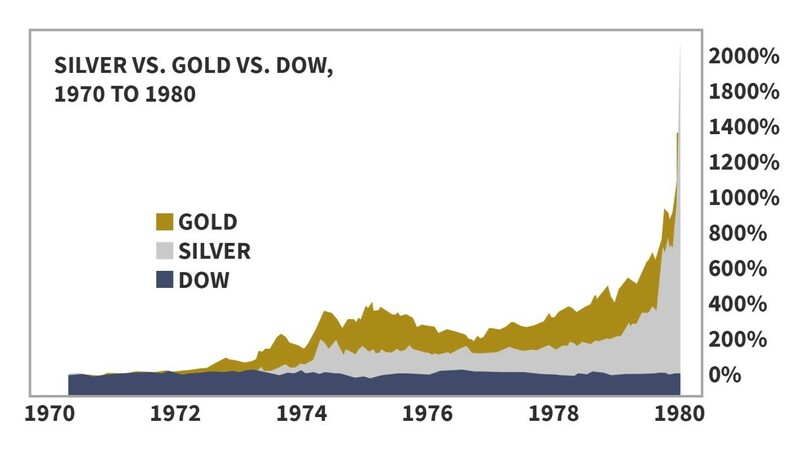 As the 1970s illustrated, gold and silver offer the potential to energize portfolios toward productive gains even when stocks sit on the sidelines. Precious metals are a true alternative asset – not just because they are genuine physical assets, but also because they offer investors a way to make money in climates where paper assets are losing ground. To learn more about defending your portfolio from stagnating markets with different types of gold and silver investments, call Augusta Precious Metals at 855-242-4121 and speak with one of our dedicated gold and silver professionals. The expected stock market lost decade doesn’t have to be as devastating to IRAs, 401(k)s and other retirement and savings accounts as you might believe. Call Augusta and get your savings protections in place today!